You can count on Kindergarten Classroom Rugs! Our dependable Kindergarten Classroom Rugs contain SoftFlex®, Which is an air-texturized, polypropylene, secondary back that is the latest advancement in area rug backing systems. We know children can be rambunctious, so our tightly woven fibers strengthens the resistance to wrinkles and provides a durable bond that withstand the most rambunctious children. 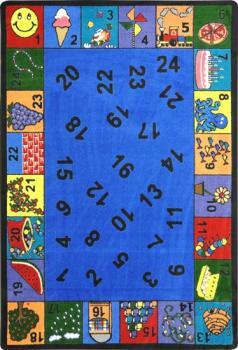 During the heat of summer, your students can comfortably sit on our heat insulated Kindergarten Classroom Rugs. We also treat the rugs with antimicrobial agents that prevent mold and mildew growth. 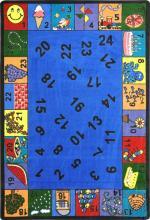 The second way that teachers can count on the Kindergarten Classroom Rugs is exactly that...Count! We designed these rugs to portray various objects that line the border of the colorful rugs. 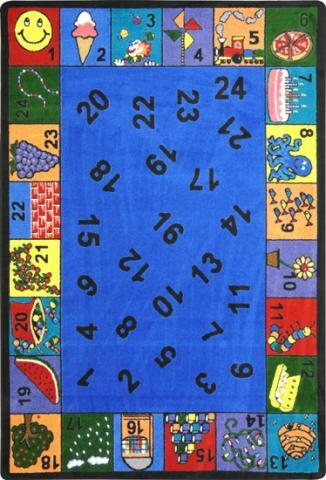 Each image contains a number, which gives teacher the perfect opportunity to teach both the number system and phonetic sounds. We also added numbers within the border that range from one to twenty-four. The easy to glue down rug keeps your students safe, while providing them with an invaluable learning experience.